Lighting your home is a key component of making it habitable and supportive of your lifestyle. However, ensuring you have enough light in your home is only one aspect of proper lighting. Another important aspect is using the best sources for your needs. The sources of your indoor light can impact not only visibility in your home but an array of factors involving your health and well-being, your productivity, your finances and your impact on the environment. By almost all accounts, natural lighting offers you more benefits than artificial light does. It reduces the regular maintenance costs of the home while doing more to benefit your health and wellness. However, it is not always as easy to implement natural lighting in a home as it is to plug in another electric lighting fixture. You must have the sunlight striking your home in the right places at the right times to harness natural light and help you to reduce your reliance on artificial lights. Not every window or skylight gets good lighting, nor can every household afford to put in new windows or skylights where they would be beneficial. Therefore, when examining the benefits of natural lighting in your home, you must also weigh them against the realities of your living situation. Research has found that natural light can effectively access from 30 to 50 percent of the interior of a building through proper placement of windows and skylights. In addition to windows and skylights, other ways to implement natural lighting in your home is by effective landscaping, as well as your choice of paint colors and use of mirrors. In general, natural lighting is healthier for people and pets alike than artificial lighting is. According to research on the topic, natural lighting was associated with increased energy and productivity levels in workers over artificial lighting. Research has associated natural lighting with a potential reduction in nearsightedness among kids and young adults due to its promotion of dopamine production. People of all ages have been found to sleep more soundly and regularly at night when exposed to sunlight each day, especially for a least 30 minutes in the mornings. By contrast, students who did not get at least this amount of short-wave sunlight in the mornings stayed awake 30 minutes longer each night before producing enough melatonin to fall asleep. Natural light also helps the body to produce more serotonin, a hormone associated with positive feelings and a ward against depression from seasonal affective disorder (SAD). Serotonin is also a natural pain reliever and helps to make you feel more rested. Also produced by sunlight are endorphins, another class of hormones associated with positive feelings. Research in hospitals has found patients heal quicker following surgery when recovering in rooms that receive natural sunlight. Research in schools has found students score higher on tests when learning and studying in naturally lit classrooms. Medical research has found that natural lighting has a beneficial effect on lowering blood pressure not evident from use of artificial lighting. Specifically, sunlight changes nitric oxide levels in the blood involved in blood pressure regulation. A lower blood pressure, in turn, reduces the risk of stroke and heart attack. Other medical research has found natural light beneficial in reducing anxiety and stress levels by facilitating better communication among the brain’s various regions. Even your immune system can benefit from natural lighting. Natural light is found to increase vitamin D levels in the body which, in turn, help to increase levels of T-cells, a kind of white blood cell that combats foreign pathogens. In addition to supporting the immune system, vitamin D is also associated with strong and healthy bones and teeth and the functions of muscles, the brain, the pancreas, the intestines and the cardiovascular system. The amount of energy your home consumes has an effect on both your wallet and the environment. To reduce your impact on both of these counts, reduce your energy consumption. One way to do this is to curtail the amount of electricity or other energy sources you use to power artificial lights. Lighting your home with energy-efficient light bulbs can lower your energy bill and reduce your carbon footprint. Lighting is generally responsible for 25 to 40 percent of the energy consumed in a typical structure. In addition to affecting energy consumption and costs, natural light also positively impacts energy consumption and consequent costs for heating a home. You can reduce energy costs in a building by a minimum of 30 percent by incorporating natural daylight into its lighting plan. More efficient natural lighting strategies can reduce those costs by up to 80 percent. There is another way natural lighting has a beneficial effect on your home finances, which is by increasing your home’s value to future buyers or renters. Natural lighting has been found to make a home appear bigger than artificial lighting. More windows also help to show off the exterior advantages to a property, such as the lawn and landscaping. Those living in regions receiving more direct sunlight must also partner the need for natural lighting with the need to keep a home’s environmental cooling costs lowered. In these instances, installing blinds that can be closed to help maintain the interior temperature of a home can be helpful. There are also numerous curtain and window treatment products on the market that are designed to insulate your windows from extreme heat from the sun and can help in the winter when temperatures are lower outside as well. If you like growing indoor plants, natural lighting is also more supportive of doing so than artificial lighting. 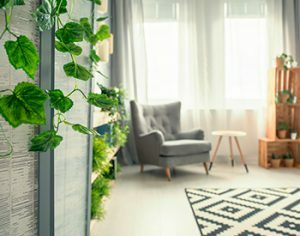 Indoor plants, subsequently, have their own benefits on health, emotional well-being and perceived rental or resale value.